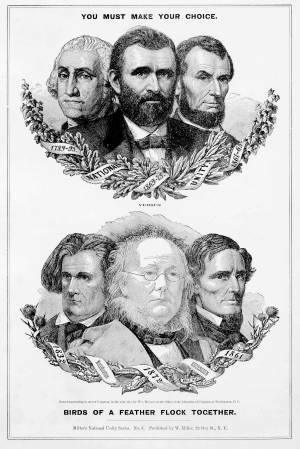 A Republic campaign broadside making Horace Greeley the scapegoat foranti-Southern and ant-Democratic feeling. Greeley is shown together with Southern statesmen John C. Calhoun and former president of the Confederacy Jefferson Davis. In contract, Republican candidate Ulysses S. Grant is placed between portraits of former presidents George Washington and Abraham Lincoln. The contrast extends to the symbolism of the portraits. The Republican portraits are partly wreathed in ivy, oak, and olive branches. The bust portraits of Greeley et. a., on the other hand, are adorned with thistles and thorns and inscried with allusions to Democratic infamies and Confederate atrocities: "Andersonville," "Fort Sumpter," "Jackson," "April 14, 1865," (the date of Lincoln's assassination), "K.K.K.," and so on. The Republicans are calledthe party of "National Unity," while the Democracts are associated wtih "Nullfication" and "Secession."